Dubai: It was an inconsequential match but it turned into a thriller. The India-Afghanistan Super Four match in the Unimoni Asia Cup ended in a tie. Afghanistan opener Mohammad Shahzad may not look like a cricketer, but he trashed the Indian attack with ease in the Unimoni Asia Cup Super Four match at the Dubai International stadium through an entertaining century to give a challenging total of 252 for 8. India chased through a 110 runs partnership between openers Lokesh Rahul (60) and Ambati Rayudu (57) but despite a valiant effort by Ravindra Jadeja, Afghanistan held India to a tie. 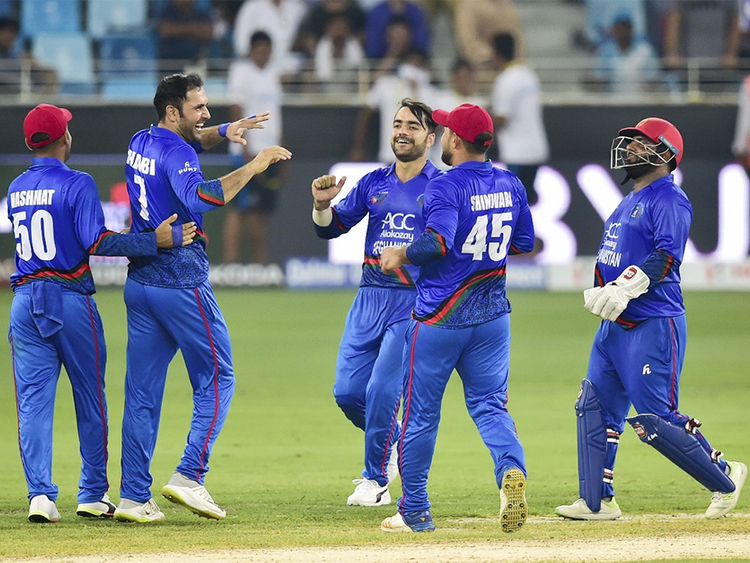 Afghanistan that had stunned top teams in this tournament and gave Pakistan a fright, walked off from Asia Cup announcing emphatically that they are a power in One Day International cricket. Shahzad, the pot-bellied wicket keeper batsman , who enjoy his food especially mutton, made mince-meat of the Indian bowling attack through an aggressive 124 runs off 116 balls with 11 boundaries and seven sixes to steer Afghanistan to a challenging 252 for 8 in 50 overs. Chasing the total, Indian openers Rahul, playing his first match of this tournament, and Rayudu put on 110 in 17.1 overs. Rayudu was the first reach his eighth ODI half century but fell at 57 lifting Mohammad Nabi to long on. Rahul too reached his second ODI half century but fell for 60, trapped leg before by Rashid Khan. Mahendra Singh Dhoni and Manish Pandey returned scoring 8 runs each. Dinesh Karthik and Kedar Jadhav put on 38 runs in 8.2 overs before Jadhav (19) got run out while backing up. When India needed 48 runs in 10.2 overs, a well set Karthik got trapped leg before by Nabi for 44. Kuldeep Yadav and Ravindra Jadeja added 16 runs before Yadav got run out for 9. Needing seven runs off the last over, Jadeja hit Rashid Khan for a boundary off the second ball and then took a single. Needing two off three balls, Khaleej Ahmad too took a single to level the score but Jadeja (25) pulled Khan into the hands of Najibullah for the match to end in a tie. Afghanistan won the toss and elected to bat. Indian bowlers, who are used to playing with cricketers who look fit, may not have expected Shahzad to stay long at the wicket. When Shahzad took guard to face the first ball, he glanced at his idol and wicket keeper Mahendra Singh Dhoni behind him. Interestingly, his innings was played in a match for which Dhoni had returned to captain the team that rested its top players. Shahzad, who loves to play the helicopter shot like Dhoni began by hitting a boundary off Khaleel Ahmad through the vacant first slip region. In the second over, he hit Deepak Chahar who was making his ODI debut by slicing over the point. India had rested five players starting from their skipper Rohit Sharma. Dhoni, who had given up limited over captaincy in January 2017, was given a team without inform batsman Shikhar Dhawan, fast bowlers Bhuvneshwar Kumar and Jasprit Bumrah as well as leg spinner Yuzvendra Chahal. Shahzad hit Chahar for a six in the fourth over over deep mid-wicket. It was the first of the seven sixes he cracked with ease. So dominant was Shahzad that his opening partner Javed Ahmadi scored only five runs in the 65 runs partnership made off 12.4 overs. Ahmadi’s innings ended when Dhoni stumped him off Jadeja. Next man Rahmat Shah lasted only four balls before being bowled by Jadhav. Kuldeep Yadav made it tough for Afghanistan by picking the wickets of Hashmatullah Shahidi and skipper Asghar Afghan for ducks. From 65 for no loss, Afghanistan slipped to 82 for 4. Gulbadin Naib and Shahzad put on 50 runs for the fifth wicket. Chahar got his first wicket in ODI by having Naib caught by Jadhav at deep square leg for 15. The experienced Mohammad Nabi joined Shahzad who was in full flow. Shahzad had hit a six off Khaleel over long on which resembled his idol Dhoni’s shot. His shot off Jadeja, going down on his knees to slog for a six, made even the Indians fans clap for it. His slog sweep for a six off Jadeja that went over deep mid-wicket into the stands was also a mighty one. Shahzad reached his fifth ODI hundred in the 29th over. He looked unstoppable when Kedar Jadhav made him hit high up to Dinesh Karthik at long off. Mohammad Nabi went on to hit his 12th ODI half century and fell caught at covers by Yadav off Khaleel for 64 off 56 balls which included three boundaries and four sixes.